Custom Molded parts are very design specific. 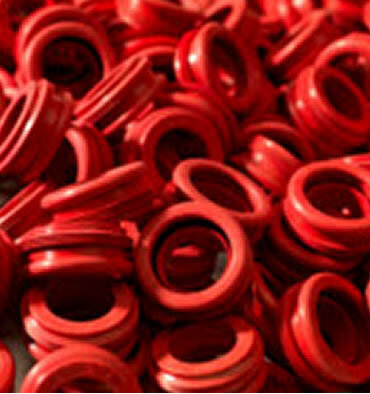 Whether they are compression, injection or transfer molded, Monroe Seals has years of experience providing customers with custom molded parts that are unique to their application. Our custom molded part experience incorporates the certification of the material within the confines of each specification, while meeting and overseeing necessary quality reports. Liquid injection molding is done very similar to standard injection molding. The mold is heated and closed before uncured rubber is injected into the mold. One difference is liquid injection materials come in pails or barrels and are two parts mixed together; one being the catalyst which uses platinum in the process, the other being liquid silicone. The curing time is much shorter than with a typical injection process. This will often lead to a lower cost with high volume requirements. The raw materials are also received in sealed containers and are typically pumped directly from the barrels to the machine, significantly decreasing any contamination. It is a preferred form of molding in the medical industry as it is considered a closed molding system. Monroe Seals is able to provide product certified to a Class VI environment. Are you looking for Molding?